By using the swing trading algorithm we will set up a swing reversal trade. The logic is the same for day trading. 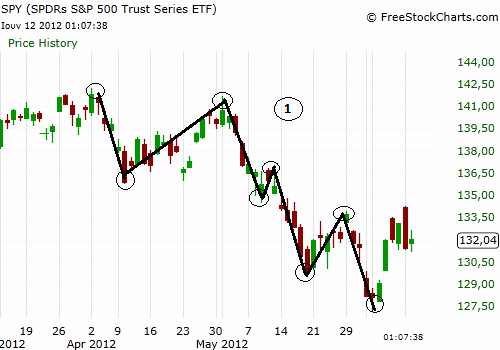 Step 1: We define market trend by using ETF SPY (below). We have a downtrend. Step 2: The stock should also be in a downtrend like CTRP below. So we are looking for a support or a resistance. When in a downtrend we have much better chances to perform a successful trade, if we short sell when price visits a resistance for the first time. In CTRP daily chart the red circled candlestick is visiting resistance for the first time and that’s why it is an entry point. We will short sell at $21.30. 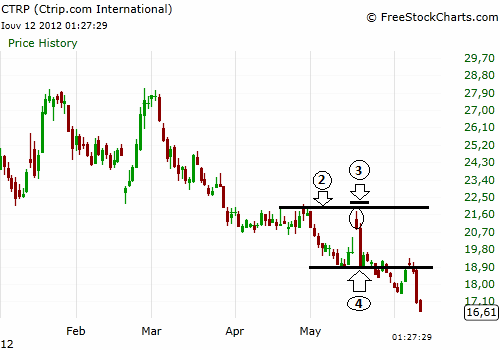 Step 3: Placement of stop is at $22.05 which is 5 cents above resistance and 75 cents from the entry price ($21.30). Step 4: Profit target is at $19 ($2.30 from entry price), where we will close at least half our position. Step 5: Loss/profit ratio is $0.75/$2.30=1/3 so we can open the position. Step 6: Assume that we have $30.000 and we are buying 800 shares. Maximum loss if price hits the stop will be 800 x 0.75= $600. So, $600/$30.000=0.02 or 2% of our cash capital and we are fine relatively to risk management principles. Steps 7, 8: We are constantly reading news about the company, that might affect our position and we are being aware about the quarterly report date.